Here are some simple tips for keeping your hardwood floors safe when you have pets. Your pets are part of your family. As much as you love to see them run around on your floors, you might wince when they’re done. That’s because you’ve noticed the unsightly scratches, dings, and dents they left behind. 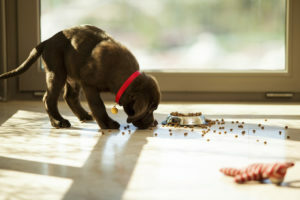 Here are some simple tips for keeping your hardwood floors safe when you have pets. The first thing you will want to think about doing is picking a different stain for your hardwood floors. Lighter stains are particularly good for this purpose. That’s because they do a better job of hiding any possible scratches that are on the floor. The lighter stain is also more effective at hiding the dust and other debris that is on the floor. It also depends on the color of your furry friend – depending on what color your pet is, you could choose that stain! A glossy finish looks good. It looks so good that it can help boost the value of your home. So if you’re looking to sell your home and move any time soon, that’s good news. But all the same, if you have pets, you shouldn’t choose glossy hardwood floors. Satin and matte do much better jobs hiding dents and other signs of damage. Plus, you might be leaving damage on your hardwood that you are blaming on your pets – don’t do that! High heels, rocks in shoes, and moving furniture around can cause more problems than you might think. One last piece of advice is to trim the toenails on your pet. This sounds silly, but it works. Dogs should have their nails trimmed every two months or so. Unfortunately, trimming the claws on your cat is a bad idea, so it isn’t much you can do in that respect. If you hear clicking when your dog walks on your hardwood floor, then it’s time for a trim. For over 90 years, Festool has been crafting quality tools for all types of jobs, and those fantastic products are now available from Jason Brown Wood Floors! Each week, we will feature a different product on our blog so that you can learn more about them too! While you’re cutting, sanding, and drilling, it can produce a lot of dust and small particulates. Festool dust extractors are specially made to keep your workspace clear while you’re working and cut down on cleanup time once the project is finished. This entry was posted on Friday, April 5th, 2019 at 2:05 pm. Both comments and pings are currently closed.